SHOUT OUT for TEACHERS PAY TEACHERS! 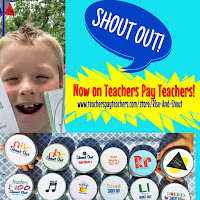 After several requests and teachers and therapists who got lost trying to find Shout Out Games, I'm now on TpT too. I'm still in the process of uploading all of the Shout Out games (it takes TIME), but I've got a good selection up and DISCOUNTED for my Grand Opening. They are only $2 this week.